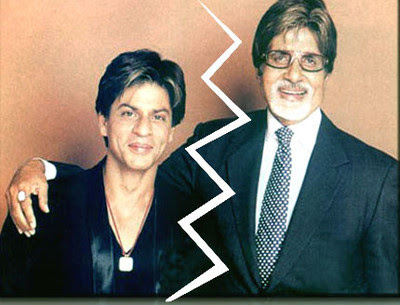 The cold war between Amitabh Bachchan Shah Rukh Khan seems to have finally ended. On Wednesday night, Bachchan visited SRK at his home, Mannat, in Mumbai's Bandra. Shah Rukh had undergone a surgery on Monday, and was discharged the next day. Shah Rukh was admitted in Mumbai's Breach Candy hospital to get his right shoulder operated after he injured himself in December on the sets of his film, Dulha Mil Gaya. Although much was written about the Bachchan-SRK war, neither of them have openly talked about it. It all started when SRK had a tiff with Amar Singh , Bachchan's close friend, during an award function in Dubai. SRK publically said that he saw 'darindigi' (evil intentions) in Singh's eyes.